In this second edition of a best-selling handbook all the chapters have been completely revised and updated, while four completely new chapters have been added. In order to meet the needs of the practitioner, emphasis is placed on describing precisely the technology and know-how involved. Adopting a didactic and comprehensible approach, the book guides the reader through theory and applications, thus ensuring its warm welcome among the scientific community. An excellent, essential and exhaustive overview. Koichi Tanaka became full professor at the faculty of Chemistry, Materials, and Bioengineering at Kansai University in 2004. His many publications cover the topics of substance transformation in organic chemistry. He is author of the best selling book by Wiley-VCH "Solvent-free Organic Synthesis". "Solvent-free Organic Synthesis is a long-needed and timely compilation of experimental procedures that do not use solvents during the reaction step. Even better, it also includes numerous syntheses that do not require solvents after the reaction for extraction, chromatography, or recrystallization, because they yield pure products in the absence of auxiliaries...This is a must-have book for all students (perhaps through libraries) and academic or industrial researchers who honestly want to use and improve sustainable syntheses, and can also be recommended for administrators and referees who control the funding of such endeavors for the well-being of our environment." "... a long-needed and timely compilation...this is a must-have book for all students and academic or industrial researchers." 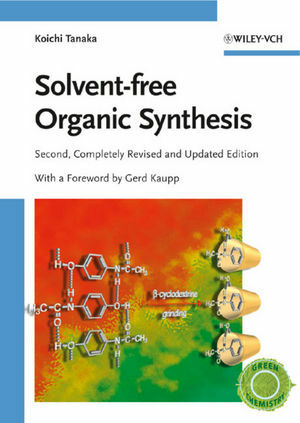 "...offers graphical summaries of 537 examples of solvent-free organic reactions..."
"In conclusion, this book constitutes an essential handbook in an excellent and exhaustive overview compilation. It is highly recommended to all those concerned with Green Chemistry as a valuable resource in the field."